The story is really nothing more than a tiny spoonful of soup, just a sip actually, dipped from a huge cauldron filled with a brew of seasonings and spices formed from of all sorts of tales and experiences told to me by those who lived in logging camps between the 1920s and late 1950s. Some of these people were adults then, some children. Without exception, all cherished those days and looked back on them as meaningful and enriching. I wish you could have been there with me. Their stories were a joy and a wonder to hear. But more than that, if you could have seen their faces like I did, especially their eyes, how they often welled with tears of longing for those earlier times. Like when an old locomotive engineer, a widower, asked if I might take him out to a now vanished logging camp so he could tell me about it, and when I did, how it soon became apparent that what he really wanted was to see one more time where he had first met his future wife. The written word, no matter how masterfully fashioned, cannot transcend the boundaries of time and space. It cannot recreate history; it can only fictionalize it. That is the best any historian can do. Perhaps through the lens of our modern ways and thinking, some might find how they lived was too hard, especially for the women. But these women did not see themselves as oppressed or dominated by male chauvinists. They saw themselves in an adventure, a dance of survival in partnership with their husbands who they loved and who loved them. Most were young. Life was hard, but it was romantic, something incomprehensible, really, unless youve lived it. The illustrations for this book were a real challenge. I usually draw everyday thingsthings I have all around me. 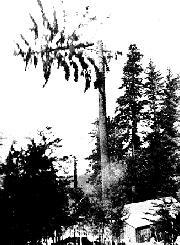 This story takes place in a logging camp in the nineteen-thirties. Some of their everyday things would have looked quite different from ours. The cabins they moved from camp to camp on the trains are nothing more than falling down shacks now, so I couldnt go inside one and see what it looked like. How did a family of four fit everything they needed inside two nine foot square rooms? What kind of stove did they have? What kind of linoleum pattern would have been in style then? The story also talks about steam donkeys. Im not fond of drawing mechanical things to begin with, and Id never seen a steam donkey working. How was I supposed to draw it? But I did like the people in the story and the way they spent their summers in the logging camps. 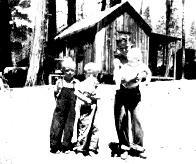 From the pictures Gary had taken of the photographs in the family albums of some of the people to whom hed talked, I could see how they dressed, what their cabins looked like from the outside, and something of their camp surroundings. Gary also helped me do research at the library and in some of his books to find photos of steam donkeys at work, high climbers topping trees, old stoves, and linoleum patterns from the 1930s. It turned out to be kind of fun. The little strip pictures at the top of the text pages gave me an opportunity to show a little bit more about what the camps looked like, and how the machinery worked than I could put into the story illustrations. 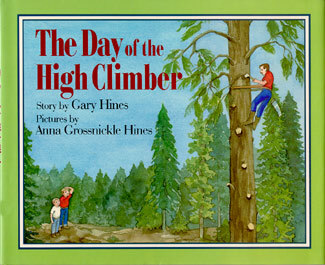 That worked out well, because I wanted to put a decorative strip at the top of those pages as I had done when illustrating A Ride in the Crummy, Garys first book about railroad logging. The other big challenge in this book was to get the scale and perspective correct inside the cabin. Since I couldnt go inside one and see how it looked in those tiny little rooms I had to make it up. I reviewed what Id learned about vanishing points, covered my drawing table with big sheets of paper and constructed the cabin and furnishings with rulers and straight edges. I wouldn't want to draw that way all the time...but it certainly helped in this case.